While this post began as a simple office makeup/first date tutorial, it ended up containing mini segments of how to apply and set concealer, how to apply cream blush, how to tightline, and how to apply lipgloss. So, it's really more apt as a basic makeup application tutorial. Basically, this is my long way of saying – grab a coffee/tea/root beer float and sit tight, ladies; it's going to be a long read. Note that I said office makeup/first date above. To me, both situations ask for My Face But Better and that's what I had in mind when coming up with this tutorial. I arranged the steps below according to importance. As in, in a (very likely, in my case) situation where you're racing against time, which steps should go first. 1 and 2 are interchangeable depending on the scarcity of your brow hairs. Tutorial here. I've harped on this point incessantly so no more belaboring. Eyebrows = most important. Bonus points to those who actually have some. The basis of good makeup is its canvas. This is why having a good skincare routine is most important in my book. I must be doing something right because my skin has been very happy of late and I am able to skip the use of foundation. 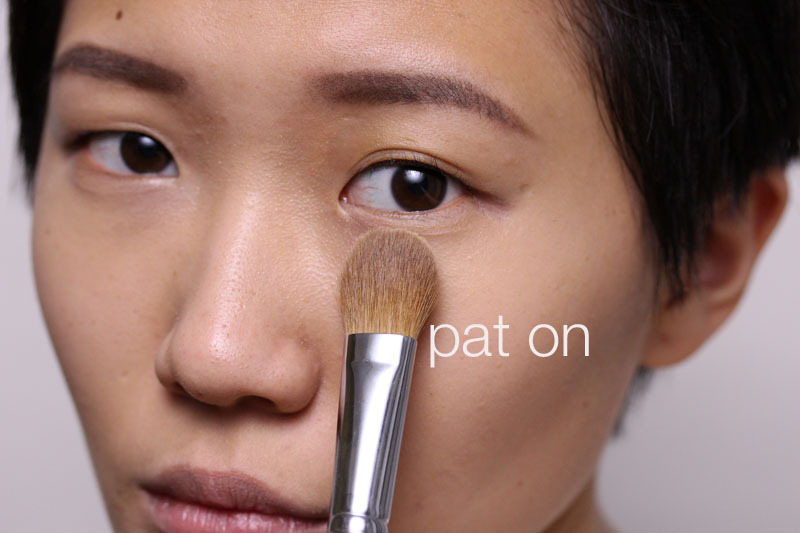 All I do is pat some concealer onto problem spots (an upside down triangle under eyes, around nose, above and below lips). Don't blend it out too much so it actually stays where you want it to be. Tip: Your ring finger applies the least amount of pressure compared to the others, so use it on sensitive areas. 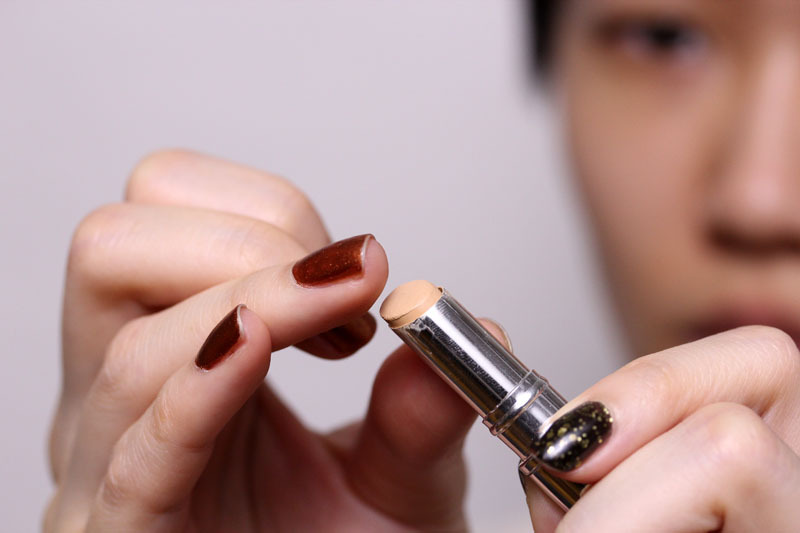 As with all other makeup on the face, the trick to having it stay put is to set it with powder. 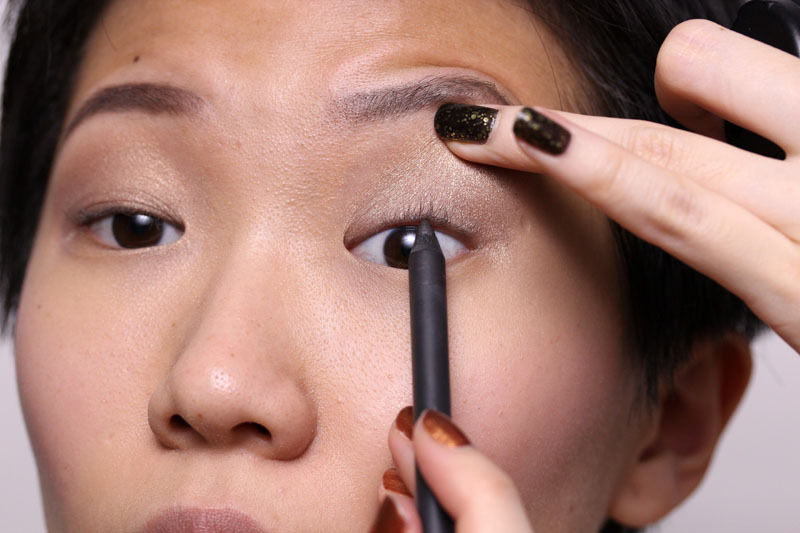 Use an eyeshadow brush that's fluffier (but not overly fluffy) for this purpose. 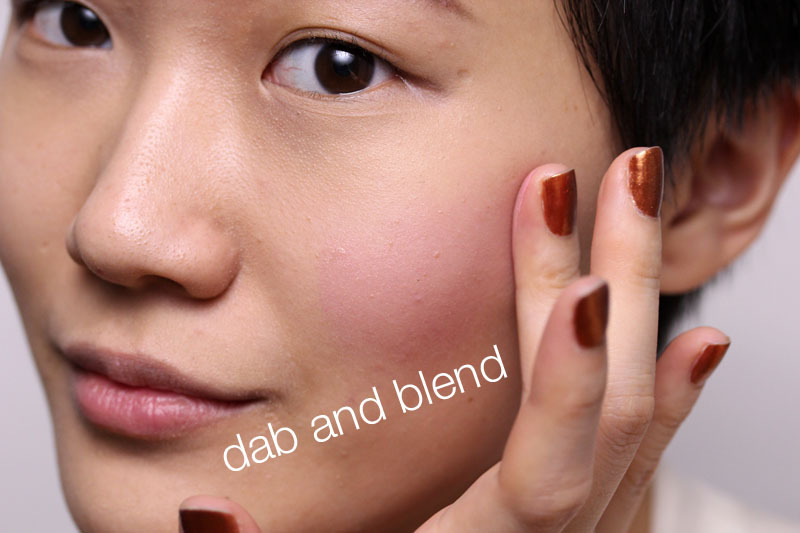 You want to pat it on, not blend. Because nothing says corpse like unflushed cheeks. I kid, but it's true that color on the cheeks is a sign of health and vitality. It makes a person look brighter and happier. 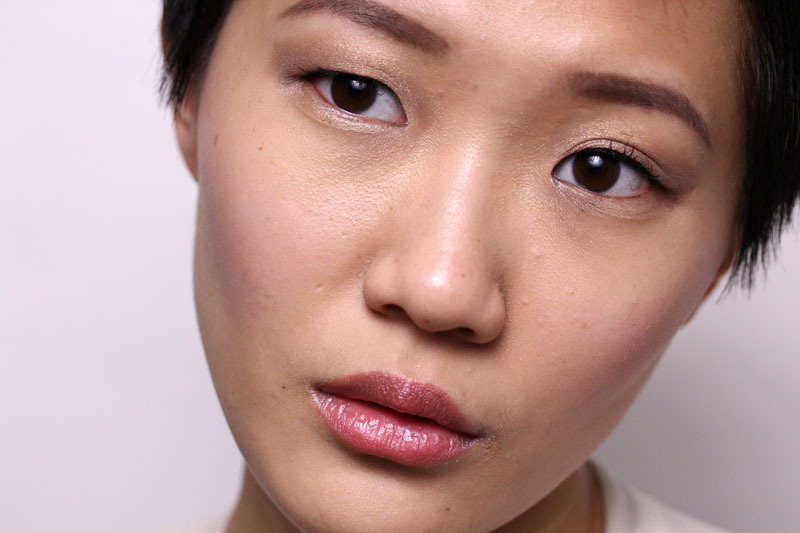 There's a plethora of options you can go for when it comes to blushing. 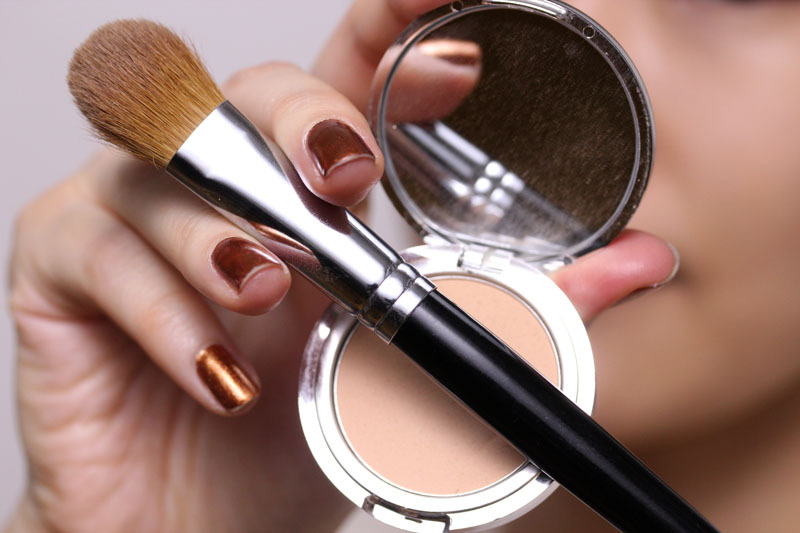 Powder, liquid and cream works the same as long as it adds the right amount of color to your face. 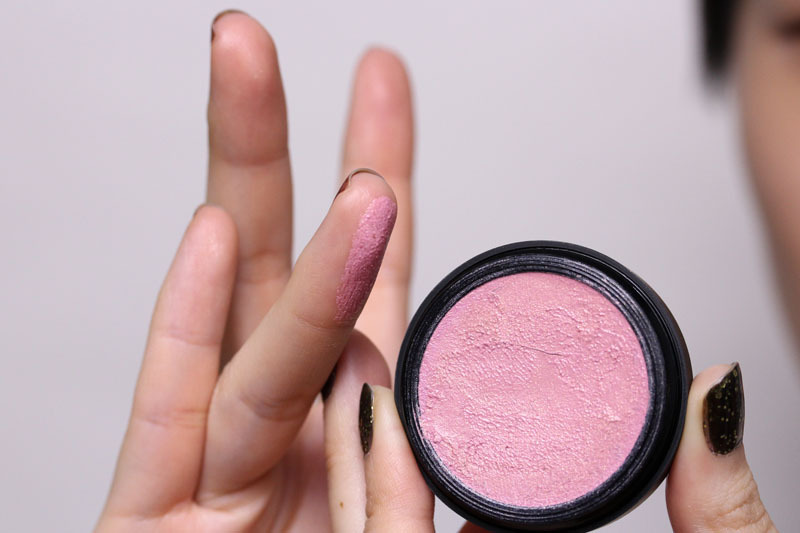 For this tutorial I chose a cream blush. I picked up pigment with my ring finger then dabbed and blended it onto my cheeks. On days that I don't contour, I am more specific about blush placement. 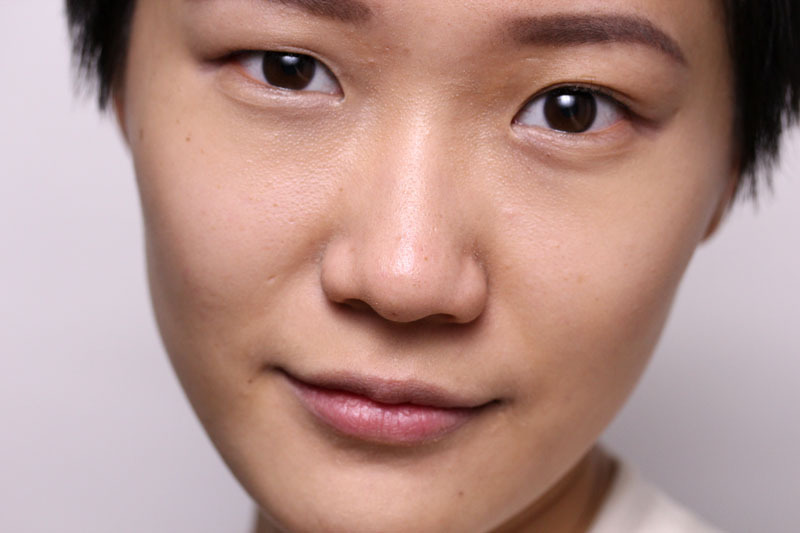 I apply it above my contour line (see below, where my cheeks sink in) and extend it to the bottom of my cheekbones and blend out so it looks natural. This step depends entirely on how much time you have. The reason I placed it under the 4th step is because you should apply eyeshadow prior to mascara and eyeliner. But if pressed for time, I'd skip it. 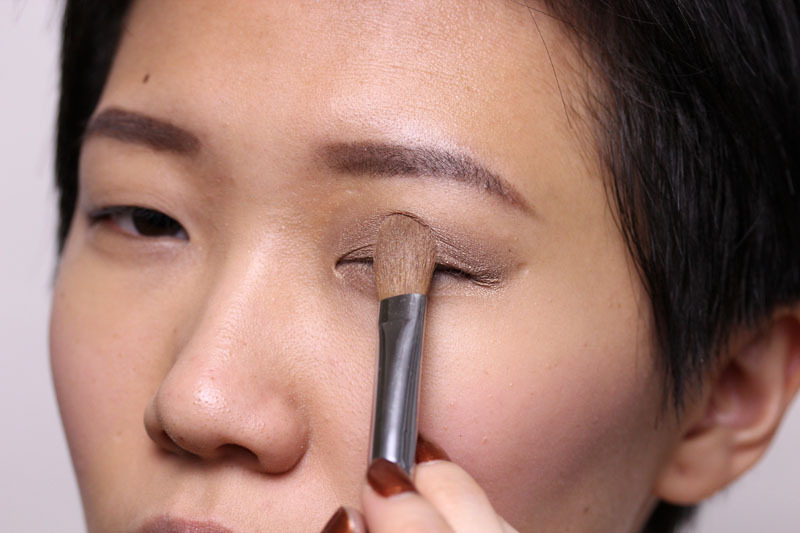 I apply my eyeshadow in a sort of almond shape. 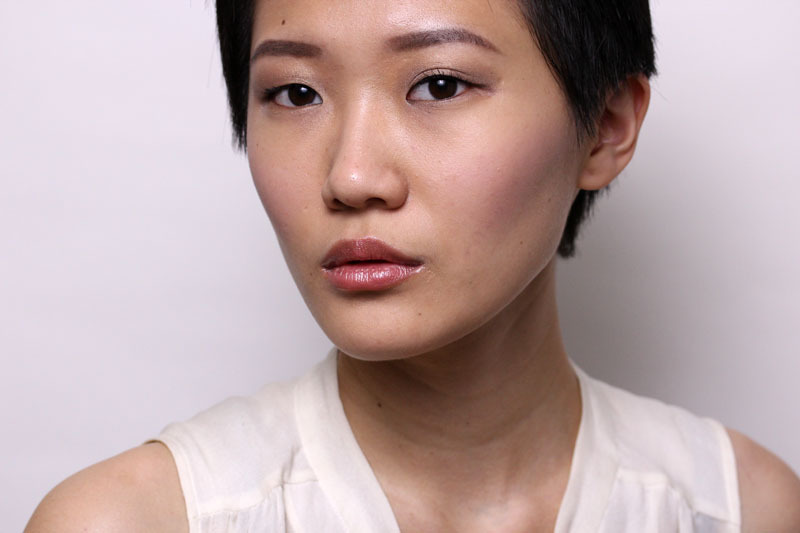 Nowadays, I've been extending my shadow beyond the lid and blending it around the crease. No particular reason for this choice but preference. Another recent practice of mine is to tightline, which means applying the liner at the base of your lashes and your top waterline. 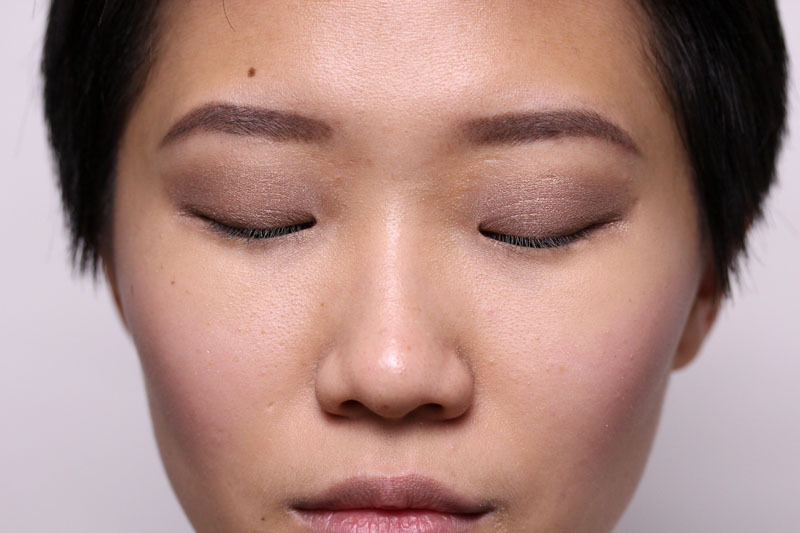 I have hooded eyelids that "swallow" everything I place on my upper lash line (for an example, view this post) and I used to draw a thick line so when I open my eyes there will be a thin line peeking through. Lately, I'm of the opinion that the real function of eyeliner is to accentuate the appearance of your lashes, and all I need for that to happen is have a thin black line at the base of my lashes. This way I also look good when I close my eyes. Tightlining is not my favorite thing to do since my eyes are like open faucets. 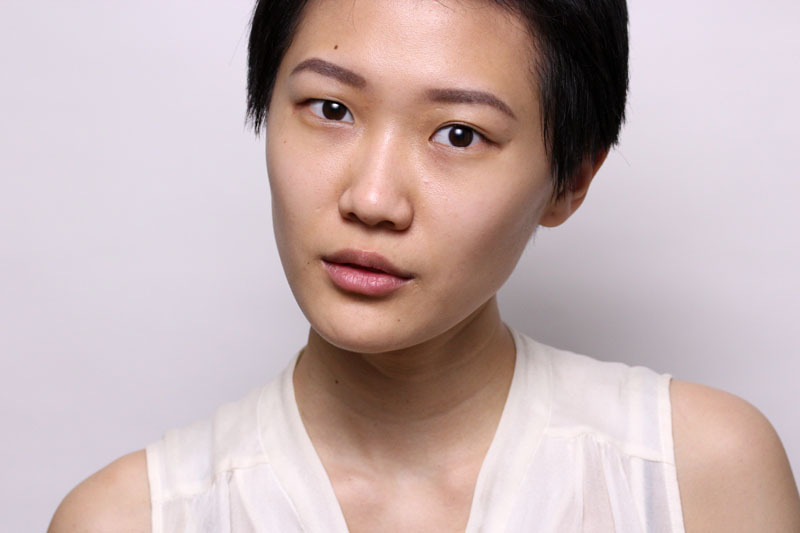 The trick is to get the right kind of eyeliner: waterproof, smudge-proof, pigmented, and with a soft tip so it doesn't irritate the delicate eye area. Finally, apply mascara of choice. This is simple enough. Apply your favorite color from the tube and you're set. Sometimes I like to soften the sides just a little by lightly going over the edge of my lips with a finger. I think it looks more natural; at least as natural as colored lips can be. 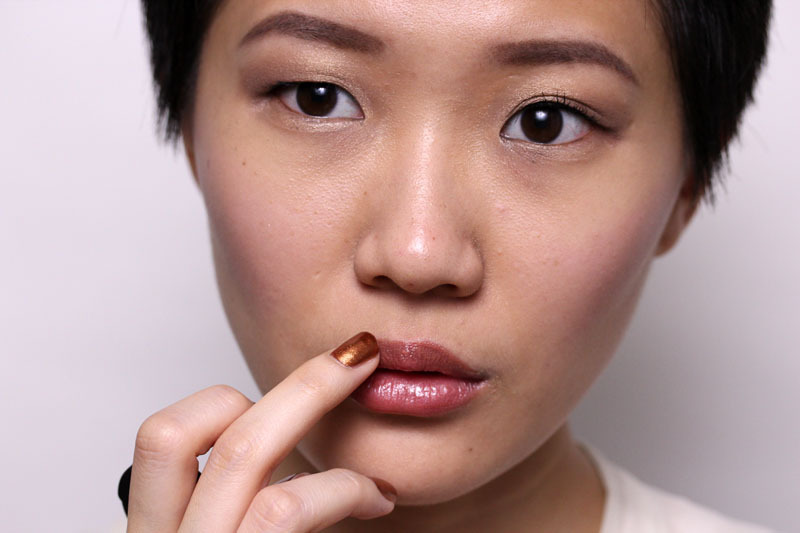 If you're not a lipstick kind of girl, you could just do a swipe of gloss instead. I like glosses since they're additional protection against the cold weather. In general they also look better on chapped lips, which I seem to have no matter what I do to them. 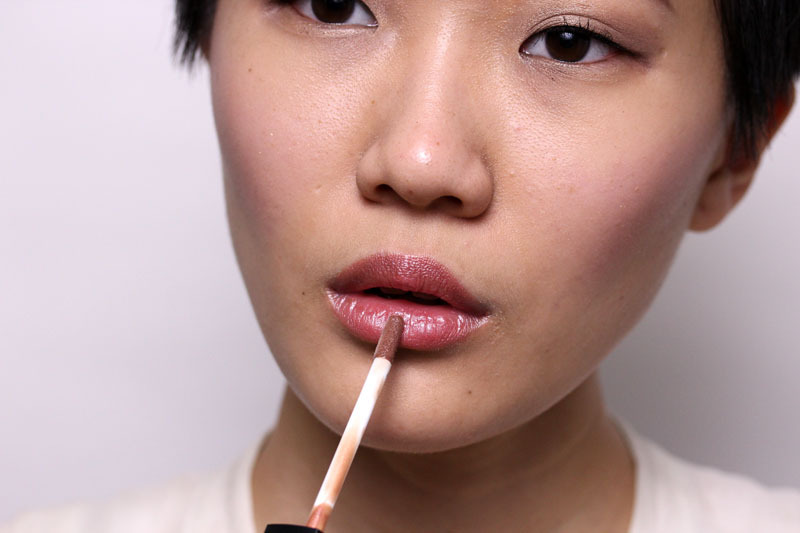 When applying gloss, start from the center of your lips and smooth out the pigment to the sides. This makes your lips look plumper but not overly shiny. Beautiful as always! Thanks! I really enjoyed your tutorial! Great article, amazing tips&tricks! Im trying to give up foundation on most days and just using a concealer and powder only, but I always feel that I "whipe" my concealer off with my beauty blender and end up applying foundation over it anyway. 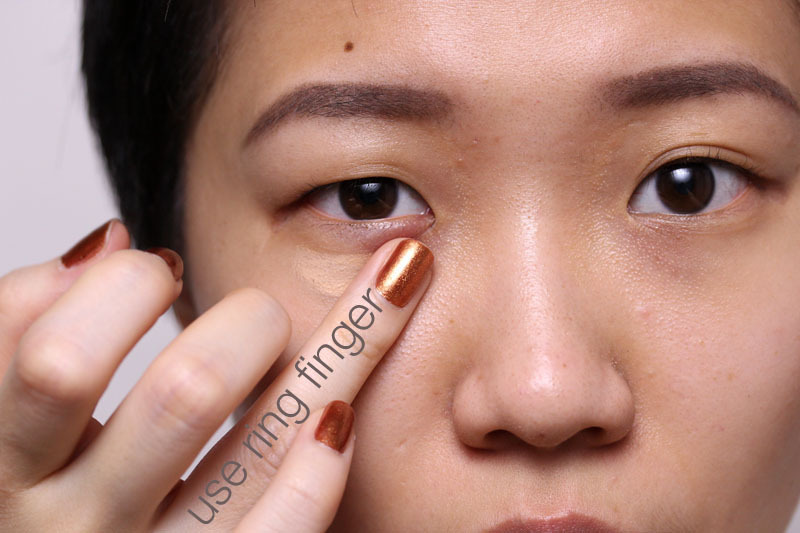 Good tip about using ring finger, will def. try this. Thank you! Hello, pretty human! :o) Nice to see someone else out there who tightlines -- nothing lifts my eye area more than faking a dense strip of lashes! Also, as can be expected, I now want everything on your face. >.< Do not panic; this is par for the course. 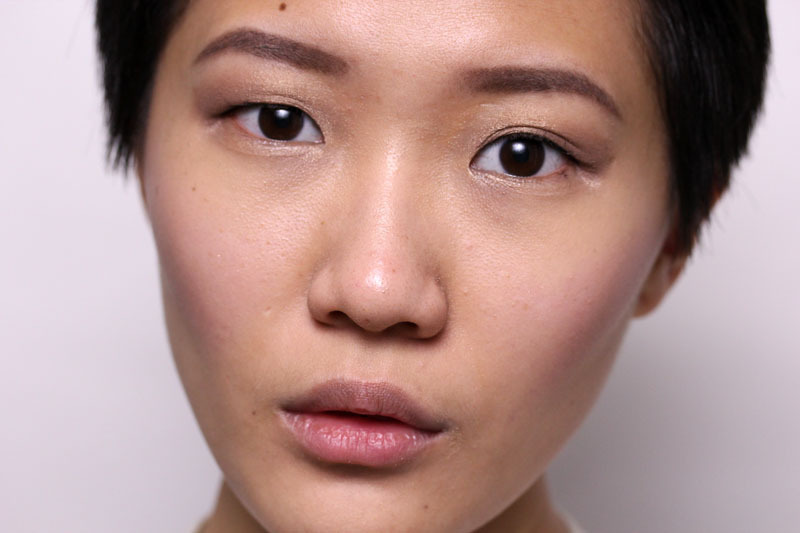 Re: tightlining - love the effect, can't be bothered with the lifting of lids and poking around(having contacts doesn't help) and nothing stays, etc etc. I could hunt for the perfect pencil, but...why? Hahahaha. so much of my "beauty" efforts stem from pure laziness. Do I NEED that THREE liner? YES YES YES!! Can I ask where you ordered it from, Xiao? I am looking online and this MUST be wrong, but one site is listing it at $68 PER liner!! My biggest issue with applying blush is that I'm never convinced I've done it right. I feel like I can't find a happy medium between "too subtle to be noticed" and "clown cheeks". This is probably because I'm really fair (porcelain skin, basically) and don't have much color in my face to begin with, so anything on my cheeks feels like too much. Any tips for getting blush right? Hm. I think this really boils down to personal preference. 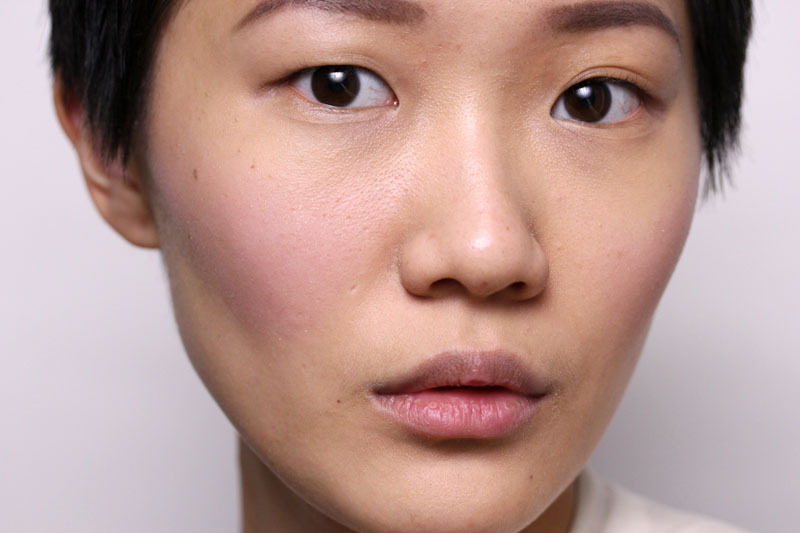 I have to say most of the time I think I overapply blush at my vanity because it starts wearing off within 10-15 minutes and does so more when "exposed to the elements." 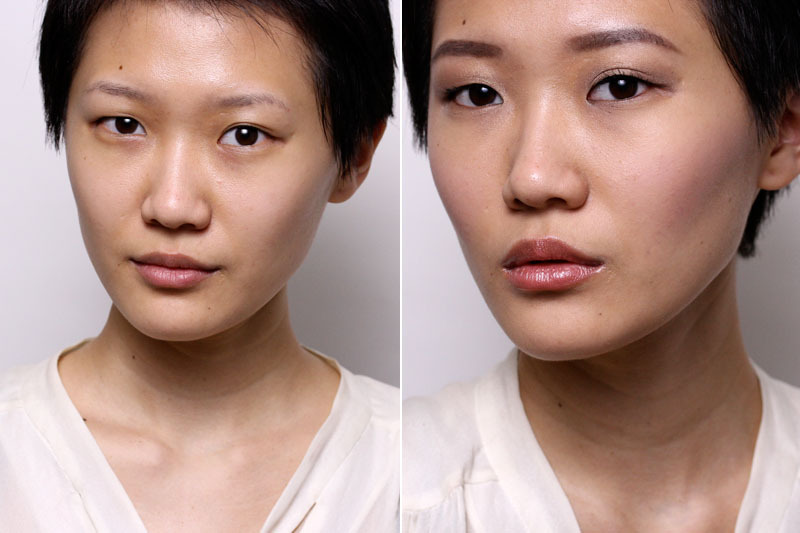 In fact, look at the pictures above, the blush melds better with the skin progressively throughout the steps. So I think, just do a tad more than what you think is "just right," and by the time you're done with your face it'll probably be the color you want it to be? Must you always look so flawless?! Thanks for the excellent tutorial. I've always just tightlined the top of my lashes but I think, based on your giudance, I should begin doing under the lashes as well. Great info and you are gorgeous as always. Thanks! 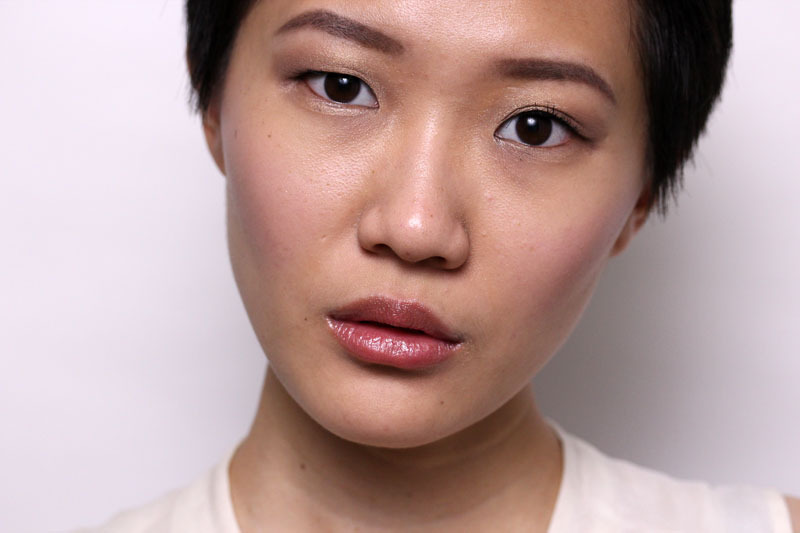 Best "no makeup" makeup look ever. Thank you! Can't get get over how chic you look with your short hair. It's inspiring me to get up the nerve to whack off my safe middling length hair.